On the tenth of April, 1803, my ancestor Thomas Gilham was baptised in the ancient parish church of St Martin’s in the village of Aldington in Kent. Thomas’ mother, Elizabeth, a local woman, was about twenty-eight years old and Thomas was her second child. Her first child, Edward Woodruff Gilham, had been baptised at St Martin’s on 17 March 1799 but sadly died shortly after his first birthday. He was buried at St Martin’s on the 14th of May 1800. The parish register provides no clue to Edward’s father but makes plain that he was the ‘illegitimate son of Elizabeth Gilham’. Similarly, when Thomas’ baptism was recorded the register is again silent about the identity of the boy’s father, but clear that he is ‘illegitimate’. The parish Overseer’s Accounts reveal more though. It seems that Elizabeth named her first born after his father, a local labourer named Edward Woodruff. Like many agricultural labourers, Edward has left few traces in the historical records. However, the Accounts for 1799 include a specific reference to a payment for a ‘journey to Elham with Edward Woodruff and Elizabeth Gilham’, perhaps referring to a journey to the workhouse in that village. They also show that between March 1799 and March 1800 payments were made for the support of Elizabeth’s child, at a cost of 1s, 6d per week until February when the cost rose to 2s, 6d per week for a further four weeks. The records also include various payments of poor relief to Edward Woodruff in the years after his son’s brief life, suggesting that he lived a fairly precarious existence. The Accounts for March 1802 to February 1803 record that Richard Higgens received 38 weeks pay for Elizabeth Gilham at 5s a week, to a total of £5 14s. And a payment is also made to a Mr Rogers for a warrant to apprehend Thomas Carpenter who, as we shall see, is almost certainly Thomas Gilham’s father. There is another payment of 2s for an examination of Elizabeth Gilham as well as payment to the Overseer for a journey to William Deeds Esquire with Thomas Carpenter. In 1803 the Overseer’s Accounts record payments to a Mrs Chittenden for the lying in of Elizabeth Gilham and then, from April 11, for the care of Elizabeth and child. On the next page we see costs attributed to the Overseer’s journey to Canterbury with Elizabeth as well as expenses paid to James Crothall in respect of Elizabeth. Subsequently there is a record of £2 2s received from Thomas Carpenter for Elizabeth’s ‘lying in’ and for a week from 10 April 1803. It seems that Thomas Carpenter was rather wealthier than the poor Woodruff, as the Accounts show that he was able to make a year’s payment at a time – at £5 4s annually – for his son’s support and that he kept this up for some years. So, what do we know about Thomas Carpenter? Well, it seems that he was about four years older than Elizabeth, having been baptised at Aldington on 31 March 1771. His parents were probably John Carpenter and Susannah Harnden who had married at St Martins in June 1764. Thomas was the fourth of seven children known to have been born to the couple. The Censuses for 1841 and 1851 show that he lived at Aldington Corner and farmed some 17 acres of land. At the time of the 1841 Census Thomas was sharing his home with a 45 year old servant, Sarah Mummery. Not long after, on 26 April 1845, Thomas and Sarah married. I haven’t found any evidence of an earlier marriage or children. Indeed, when he died Thomas left his property to his wife and to his nieces and nephews. Having remained in the district a remarkable 81 years, Thomas was buried in the local church yard on 18 November 1852. When Thomas Gilham was three years old his still unmarried mother gave birth to a daughter. Named Mercy, for her maternal grandmother, she was baptised at St Martin’s on 17 August 1806. Again the parish register makes clear that the child is illegitimate. The Overseer’s records again include payments for the care of Elizabeth and child from April 1806, then for her lying in, and subsequently for the support of Elizabeth and her two surviving children until October that year. Unfortunately to date I have not been able to obtain information about Mercy’s father. On 4 July 1810, when Thomas was seven years old, his mother married a local labourer, William Hill. Just on nine months later Elizabeth gave birth to twin girls, Maria and Charlotte. Then, in April 1815, the young family again takes pride of place in the local church for the baptisms of Abigail and Benjamin, and in 1817, for Elizabeth Jefferies. We know from later records that Thomas was unable to write and that he signed his name with a mark. No doubt his childhood was short and he was probably labouring on the local farms while his younger siblings were learning to walk and talk. Kentish agriculture relied on the labour of men, women and youth for ten or more hours a day and workers required strength, stamina and an ability to use a wide range of implements – ‘the spade, the scythe, the hoe, the axe, the sickle, the flail, the beck, the bagging-hook, and the other implements of husbandry [that all required] a cunning and handicraft of their own’. Young men could be employed maintaining the extensive network of ditches that drained the reclaimed marshlands; or in ‘plashing, binding and quicksetting of hedges’ to make the fields stock-proof; or in manuring the land by spreading large quantities of ‘farmyard dung, mud, seaweed, malt-dust and domestic waste.’ No doubt Thomas tried his hand at some or all of these tasks. All I know is that by 1826 he claimed that he worked as a farmer and ploughman for a Mr Bolding. Tracking down who Mr Bolding was or where he farmed has so far proven elusive, in part because the name and its numerous variants seems to have been quite common in the district. While the long hours of work took up much of Thomas’ time there was still time to think about family. Indeed, in 1823 Thomas found himself with an ‘instant’ family. As he stood in the aisle of Bilsington Church his bride, twenty-seven year old Frances Furner, was most likely already pregnant with their daughter, Louisa, who would be born just seven months later. Probably watching the ceremony were Frances’ three older children who would make up the rest of Thomas’ ‘instant family’. Eight year old Delia had been baptised at Bilsington on 8 October 1815. The register suggests that her father was a local labourer named William but I haven’t discovered any more about him. Delia’s brothers, or perhaps step-brothers, James Richard Furner and William Newman Furner were baptised at Bilsington on 5 July 1818 and 7 May 1820 respectively. Again, I have not discovered the identity of their fathers. Thomas and Frances’ daughter, Louisa, was probably named for Frances’ sister. The baby was baptised on 11 April 1824 at St Martin’s, Aldington. No doubt Frances spent many a night rocking her baby to sleep while her husband was out making a bit of extra money along the shoreline and marshes of the Romney Marsh. Thomas was already heavily involved in the smuggling trade. Indeed, when his first son Thomas was only six months old, Thomas senior was involved in a momentous event that would change their lives forever. It was probably on the local farms or in the inns, if not in his own home, that the young Thomas Gilham heard about the money that could be made evading the tax man, smuggling goods ashore from a multitude of vessels that travelled to and from France and up and down England’s south east coast. By all accounts many of the locals were involved in ‘the trade’ in one way or another and smuggling activities enjoyed a general level of community support, although it seems that this began to dissipate as the stakes grew and the gangs became more violent. The history of smuggling along the Kent coast is a long one, dating back to the reign of King Edward 1 in the thirteenth century. However, it seems that a resurgence in this traditional activity was triggered at the end of the Napoleonic Wars, from 1815, when thousands of men used to a life of adventure in the Army or Navy were no longer required to defend the realm and were discharged, with little preparation, for an uncertain and perhaps unwelcome civilian life. It is likely that the Aldington Gang, also known as the South Kents or Blues, formed around this time although the first public reporting did not appear until 1820. In November 1820 the Gang was part of a combined operation involving some 250-300 men landing spirits, tobacco and salt from a French galley on the coast between Sandgate Castle and Shorncliffe Battery. Three months later, the Gang suffered a blow when of its men, Cephas Quested, was captured and subsequently hanged for his role in a violent clash that became known as the ‘Battle of Brookland’. While Thomas Gilham’s name does not appear in these early reports the records do show that by the time the Gang was broken up in 1826 Thomas was one of the inner core of twenty or so individuals who were deployed in fighting parties to protect the men carrying the tubs of contraband goods. They carried firearms and long ash staves or ‘batts’ and were paid 20 shillings a night for their dangerous work (compared with the 7 shillings paid to those carrying the tubs from the beach to the carts waiting inland). Thomas’ key role suggests that the Gang’s leader, George Ransley, thought highly of him, perhaps reflecting particular skills and bravery; perhaps reflecting length of experience and long-standing loyalty. Not that skills or loyalty would do much good after the night of 30 July 1826. On that evening the smugglers were conveying tubs of illicit spirits from a boat closer to the Dover shore when they were discovered by a local seaman who fired a warning shot that brought Preventive Service Quarter Master, Richard Morgan, to the scene. Morgan was shot by one of the smugglers and died at the scene as the gang disappeared into the night. This was the beginning of their demise. The Customs Chief quickly offered a large reward of £500 and a free pardon to anyone offering information leading to arrests. Eventually two members of the gang, John Bushell and Edward Horne were caught and induced to inform on their colleagues. Thomas Gilham was arrested, along with George Ransley and five other gang members one Tuesday morning in October 1826. Handcuffed together, the men were marched to Fort Moncrief where they embarked on a naval vessel to Deptford in London; a plan that was apparently devised in order to forestall any rescue that my be attempted by a sympathetic populace. Here they were interrogated, charged and held on remand at the House of Correction. A fortnight later more gang members were arrested and taken to London. On 6 January 1827, Thomas and his companions were back in Kent, facing Justice Park at the Maidstone Assize Court. Thomas Gilham, George Ransley and nine others were firstly charged with the murder of Morgan. All pleaded ‘Not Guilty’. Then further charges, under the Revenue laws, were heard. All the prisoners pleaded ‘Guilty’ to these offences. When it came to hearing the charge of murder against the twelve men the Solicitor-General stated that as the lives of those charged were already in such peril, because of their admission to the other crimes, he did not propose to offer any evidence on the murder charge. Nevertheless, Mr Justice Park passed sentence of death on the sixteen men in the docks, advising them to prepare to meet their God on Monday the 5th of February in case a reprieve was not granted. On the Monday morning a large crowd gathered at Penenden Heath near Maidstone to watch the executions, only to be disappointed when they learned that the Royal Prerogative had been granted four days earlier. The death sentence had been commuted to one of transportation for life to Van Diemen’s Land. Shortly after, Thomas and six others embarked on the York hulk at Gosport, the rest of the convicted men were taken on board the Leviathan. Nearly three months later, Thomas, along with George Ransley and others from his gang boarded the Governor Ready for Van Diemen’s Land. On 5 April 1827, the Governor Ready set sail with 191 male convicts on board. She was a relatively new, well maintained and sound vessel and the journey to Hobart took only 118 days. Only one man died on the way and the conditions on board were reportedly infinitely better than in the hulks. The ship arrived in Hobart Town on 31 July and the convicts disembarked on 7 August. The local newspaper, the Colonial Times and Tasmania Advertiser noted that the prisoners were ‘from the country parts of England, and are said to be generally useful men.’ Convict records show that Thomas Gilham was ‘very orderly and correct’ on board the hulk and ‘good’ on the journey to Van Diemen’s Land. Thomas – what was he like? 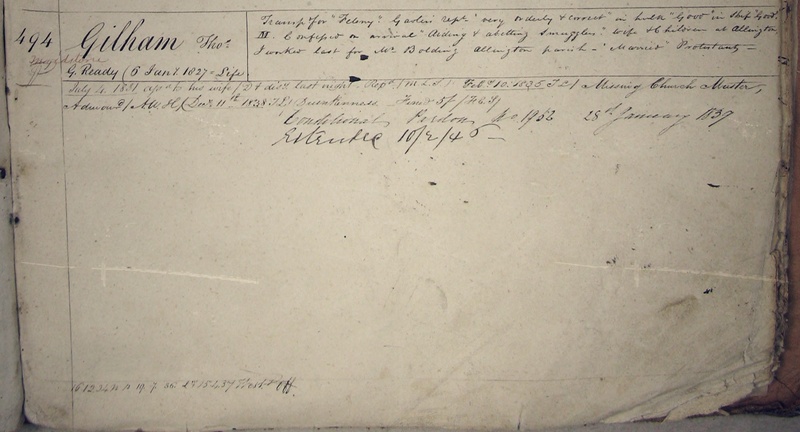 In addition to telling us that Thomas was well behaved in the hulks and during the voyage to Van Diemen’s Land, the convict records also give us our first official description of him. At the age of 26 he is recorded to have been 5 feet 7 1/2 inches tall with brown hair and hazel eyes. He had a scar on the outside of his left arm, a mole on the front of his neck and another on one of his shoulders. Some further conclusions about Thomas’ appearance and character can be drawn from the testimony provided at the trial by former Gang member, Edward Horne, who turned King’s Evidence to save himself from conviction. Horne provides accounts of various smuggling expeditions and frequently comments that Thomas was among the small group entrusted to carry arms. Horne recalls a conversation with John Bailey on the night of 6 August 1826 which was published in the Morning Chronicle: referring to events at Dymchurch that night, Bailey said ‘… that his brother Gillum [sic] (they had married sisters) was a good-hearted fellow, and he would sooner have him for a ‘scout’ than any one else, as he had broken his gun over the head of one of the blockaders.’ He went on to say that he had overheard Ransley say that since Giles had been shot all the scouts were afraid, with the exception of himself, William Smeed and Dutchy (a derivative of Thomas’s alias, Datchet Grey). On his arrival in Van Diemen’s Land, Thomas Gilham was assigned to Joseph Archer, at Lake River in the north of the colony. James Cooke, Isaac Gooday and fellow Aldington Gang member, Thomas Dennard, were also assigned to Archer at this time. Archer was about two years into the construction of his beautiful country estate, Panshanger, on the Lake River. A visitor to the estate in 1830 remarked that Panshanger was beautifully situated on a little hill by the side of the river and that Archer’s large nurseries of English oaks, ashes, acacias, firs and elms promised to thrive. A fine flock of a thousand sheep were feeding near the house but the visitor was particularly drawn to the thirty or forty beautiful mares and colts galloping about. ‘The view from the house at Panshanger was a complete panorama: the sweeping valley and winding river, in the foreground; the various forms of well-wooded hills; and, in the distance, the blue western range, on one side; and the Humocky Hills to the east on the other.’ One wonders what Thomas made of this vista and what part he played in maintaining the homestead, grounds and livestock. … a man of genial but not genteel manners, a man of heroic disposition who had been endowed with … courage and … drive [and an] attachment to what he called the religion of every good man … Archer, too, had that gift to surround himself with beauteous things; but he was also a man of some quickness of temper. Beginning to build the mansion of his dreams he became more and more exasperated by the indolence and rudeness of his convict servants. One day in anger he snatched a stick and asked one of his convicts if he had a damn good hiding whether it would do him any good, and when the convict, cheeky and irreverent, said he did not know, Archer struck him four or five times with the stick, telling him in between blows that this would teach him not to let pigs into his master’s garden. Two of the convict servants, having been refused a pass to proceed to Hobart Town to lodge complaints against such beatings and threats to blow their brains out, absconded. Archer then demanded more convict servants to sow the soil on his estate at Panshanger with English grasses, and plant an Englishman’s park in the sombre bush of Van Diemen’s Land, but the Lieutenant-Governor had to remind him politely that the supply of such hands was limited. Thomas appears to have escaped Archer’s harsh judgement as his record is completely silent during this period. In any event, within a year or so Thomas was assigned to Archer’s neighbour, Lieutenant William Thomas Lyttleton. 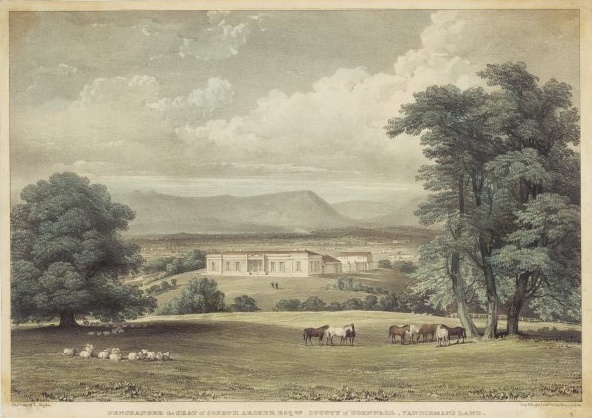 Lyttleton was also in the process of constructing his estate, Hagley, near Westbury. Again, I have not discovered anything about Thomas’ time serving Lyttleton, except to confirm that Lyttleton was instrumental in securing Thomas’ reunion with with his family and that Thomas’ record remained blemish-free. Lyttleton was advised to resubmit his application ‘when the man has been twelve months in the Colony, at which time it will be complied with.’ This was duly done and, in October, Lt Governor Arthur transmitted Thomas’ details to the Colonial Office. Frances and the children arrived in Hobart Town on 14 January 1829. The wives and children of some of Thomas’ smuggling companions were also on board the Harmony. Rhoda Higgins, Mary Giles, Catherine Bailey, Sarah Pierce and Elizabeth Ransley and their children were no doubt already well acquainted and presumably their companionship helped to lessen the fear and tedium of such a journey. Together with the five children already mentioned, Frances travelled with an eight month old daughter, also called Frances. Clearly not Thomas’, this child took the Gilham name but, like the three elder children, she was excluded from her step-father’s will. Unfortunately Frances and her family were the last to leave the vessel, having been detained until 7 February by Thomas’ failure to arrive ‘from the Interior and inability to procure a conveyance for them to his master’s place of residence.’ Indeed at one point it looked as though Frances and the children might have been sent to the Female Factory as the ship’s captain was anxious to depart and to recoup the additional expense of housing the family for 21 days more than originally intended. No doubt this was an interesting, and perhaps rather tense, family reunion, with Thomas accounting for his worrying delay (was Frances concerned that she and the children had been abandoned?) and Frances accounting for a child and the affair that led to her conception. Thomas and Frances had seven more children in Australia. The first, Mary, was born about 1830 but sadly died when she was only five months old. She was buried at Longford on 7 September 1830. 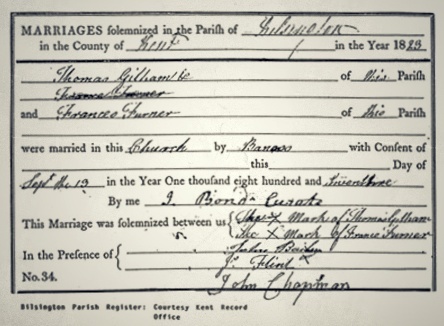 The next significant family event occurred on 24 February 1831 when sixteen year old Delia married George Mc Donald, a ticket-of-leave holder. George had been convicted of theft in his home county of Wiltshire and transported aboard the Dromedary in 1820. He had applied for permission to marry Delia on 20 January 1831 and had also applied for an allotment of land in Longford in order to ‘erect a Weather Boarded dwelling house of thirty feet front and sixteen feet deep to be fenced with a good paling fence’. 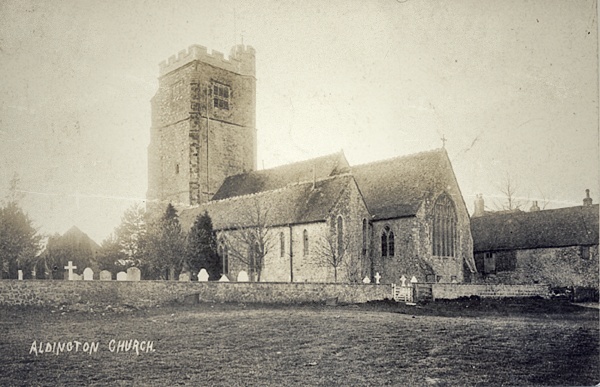 George and Delia were married in the then parish church of St Augustine’s (later demolished). Meanwhile, Frances was pregnant again, this time with twins. Joseph (my Great Great Great Grandfather) and his twin, Israel, were born on 7 November 1831 and baptised on 8 April the following year at Norfolk Plains. Before the twins reached their first birthday, Frances was also a grandmother. Delia’s first child, George, was born on 15 October 1832. Hopefully Frances and Delia had a strong relationship and were able to help each other as more children and grandchildren were born each year. Thomas and Frances had four more children: Catherine was born on 8 November 1833, Edward on 25 December 1835, Maria on 9 February 1838 and Elizabeth Susan on 21 May 1843. Delia had another five children over this period and a further six up until 1862. Sadly, family life wasn’t all about births, baptisms and marriages. In 1848 Thomas and Frances lost their daughter Louisa, at the age of 23, to fever. Notwithstanding her youth, she had been married seven years to William Snooks and produced four grandchildren (although one had died the previous year). Six year’s later, Louisa’s bachelor brother Thomas died of Bilious Fever. He was 27. Louisa’s husband died in 1852 leaving three young boys to be cared for by someone. As he had no family in the colony it seems most likely that they would have gone to live with Thomas and Frances. While Frances was raising their children and helping with grandchildren, Thomas was farming, building a small property portfolio, and he later became a publican. In 1830 the male dominated population of Norfolk Plains consisted of 580 free people and 420 convicts. Longford comprised about 30 small houses and Westbury was not yet considered even a village. About 123000 acres had been granted to settlers in the district, of which about 5500 acres was being used for the cultivation of wheat, barley, oats, peas, potatoes and turnips. Already the livestock population included about 75ooo sheep and 23ooo cattle. The Van Diemen’s Land Company had holdings in the area and the opening up of roads from Launceston to the Company’s holdings in the far north west presented opportunities for those with some entrepreneurial spirit and, while the details are sketchy, Thomas Gilham seems to have capitalised on this. At the time of the 1848 Census, Thomas was living at Glenore as a tenant of William Bryan (who, following a feud with Thomas’ former master William Lyttleton, had left the colony for London and his properties in Ireland). A return of tenant farmers in 1851 has two listings for Thomas Gilham at Westbury. The first is for 183 acres of cleared and fenced land with buildings at Hagley and the second is for 483 acres cleared and fenced. Both were rented from William Bryan at 12/6 per acre. Thomas and Frances’ sons were all unmarried at this time so there was likely to be plenty of help on the land and, in turn, it needed to provide enough to support a large family. From 1853 things began to change as the children married and began to make their own lives. Was this what prompted Thomas to start investing in more residential properties? While living there he purchased two properties at Westbury and he seems to have moved into the town by August 1854. An 1855 a list of Jurors for the Westbury district included ‘Thomas Gillam, a farmer of Westbury’ and his qualification was a ‘Yearly income of £50 or more out of real estate’. Interestingly his step-son, William, qualified on the basis of real estate worth £500, while son Joseph qualified because he was the ‘occupier of land valued at not less than £80. By 1858 Thomas owned substantial property in Carrick. He had leased the Prince of Wales to Thomas Lawson; he leased a house and shop adjoining the Carrick Hotel to Robert Beck and another house to the local surgeon, Edward Roland Bower. Apparently this house was next door to the Plough Inn. According to the Valuation Rolls, Thomas’ Carrick properties were worth a total annual value of £210. At the same time, Thomas owned three properties in Westbury. A house in Shadforth street was rented to James Clancey, 10 acres of land in Moriarty Street were leased to William Holland, a house and four acres of land in William Street were leased to Josiah Shelley. Another house and shop in Hagley were rented to David Parry. The total annual value of these properties was estimated at £83. Thomas lived in the Shadforth Street house from 1860 to 1862 but then rented it again, to George Best Jnr. The ten acres of land bounded by Moriarty and Arthur Streets were leased to William Holland until 1867 when Samuel Chappel (who features elsewhere in my family history) took them over. Josiah Shelley rented the house and land in William Street until 1864 when Allen Airey took them over. Thomas died of ‘natural decay’ on 15 May 1865, leaving his property to his wife Frances and, on her demise, to his six living children and the children of his deceased daughter, Louisa. He was 62. Frances died four years later, also of ‘natural decay’, aged 73. In her will Frances made clear that savings she had made since her husband’s demise should be distributed equally among her ten surviving children. Thomas’ was quite a transformation; from illegitimate child, labourer and ploughman, smuggler and convict, to successful property owner and business man. If you have any additional information I would love to hear from you – please email. The header image at the top of this page is taken from an old postcard of Clap Hill, Aldington. This is brillian. I am researching Louisa for my husbands side that this has helped SO much. Thanks and keep up the great work. “he worked as a farmer and ploughman for a Mr Bolding.” I have a very extensive amount of information in the Bouldings/Bouldens (didn’t we write to each other a while ago?). Styled as “Mr Bolding” probably reduces the number of Bouldings you might be looking for. I suspect this may be John Whitfield Bolden (b1769 Folkestone) who married Jane Knowles in 1825 as he appeared to be a tenant farmer in Aldington at this time. He rented land in Aldington from Wm Deedes from 1817 to 1832. The other Bouldings were ag labs at the time. I have just read this site with great interest as my ancestor had the Jolly Farmer’s Inn in Carrick in 1853,which he then handed onto Eliza Bourke. I was interested to see that you said your ancestor Thomas was the first owner. Just came across this page. My great, great grandmother was the Eliza Bourke that you mention above. Most interesting. I am descended from George Clancy/Clancey, builder of the Great Western Hotel, Westbury and brother of James Clancey, butcher of Westbury & later of Ballarat and Carlton, Victoria , who is mentioned here.